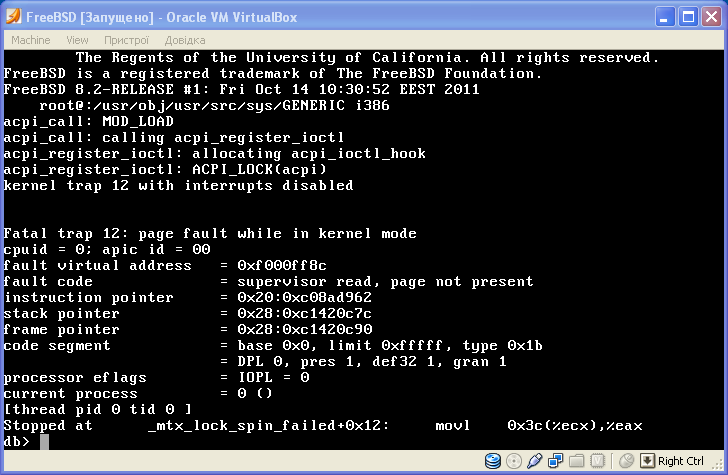 AFAIK, it's related to general locking and modules init order (it crashes on acquiring mutex lock), not to ACPI directly. Module is useful for nvidia ion videocards switch: needs grab arguments for your hardware in github forks of linux acpi-call. Last method should return 0x03 for disabled chip. Also, acpiconf -i0 should show lowest discharging. gelraen knows why module crashes, he needs a pile to fix this. Try DRIVER_MODULE(9) instead of DECLARE_MODULE(9). I'm not acpi expert, but USB drivers use DRIVER_MODULE, i.e. So, uhub will be loaded before usb dangle drivers. Did someone tested with acpi_call recently. Let's say against 11.2 ? I'm trying to make use of acpi_call to disable my Optimus Nvidia card in my laptop. Above command leads to an instant reboot. @nirnr00t How did you figure out the arguments you have to pass in ? This also leads to an instant reboot. Unfortunately I can"t find any related log line in /var/crash/core.txt.x this time. So I'm wondering. Are these crashes only happening because of the way I use acpi_call, not passing the right arguments ? Yes, I am using acpi_call with 12.0 with custom BIOS & ACPI tables and it works without reboot. Maybe worth to add that the current port of acpi_call works for me for 12-Release. There has been an update to the port which fixed the reboot issue I had.